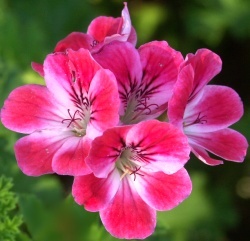 Many scented geraniums have names that leave you wondering why they are called this or that. Apricot Scented Geranium doesn't smell like an apricot (what does an apricot smell like anyway?) but it does have a nice scent and it is a highly decorative plant. Surely the name for this plant has to do with spectacular color found in the flowers. These clusters of flowers are present in early summer. They make ideal candidates for flowers to candy or use in edible preparations. 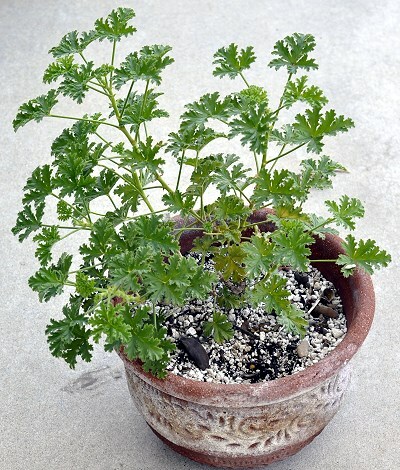 Apricot Scented Geranium makes an attractive container plant and can be enjoyed as an annual where winters are not mild enough for the plant to survive. 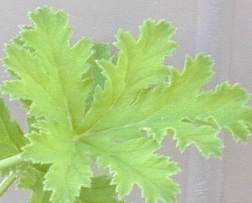 The plant below is only about four months old. It is planted in a large pot that contains about two gallons of soil. If it is carried on to the next season, it will most likely need a larger container to keep growing well. 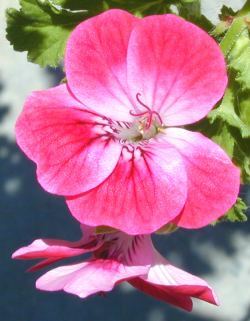 The oil glands of scented geraniums are located on the back of the leaves and open as the temperature rises. These oils actually act as coolant for the plant which allows it to endure heat and some drought.